A few weeks ago I discovered Habibi Halaqas and was so thrilled I couldn’t contain my excitement. MashAllah I have been writing since I was a kid. But everything’s got to have a focus; a positive and productive direction, something rewarding. When our very talented and learned sister Kanika asked me to contribute to Habibi Halaqas, I thought what could be better than to write for fellow Muslimahs? We’re going to be sailing on the ship of moral excellence towards pleasing our beloved Allah. The Muslim Ummah needs a lot of repair and healing, don’t you think? The kind of fanaticism and extremism that has infiltrated the fraternity is entirely because people have chosen to deviate from Allah’s path. And it may surprise you but I feel that Muslimahs are partially responsible. As Muslimahs, we’re powerful individuals if you think on it. As homemakers we are built for a purpose. We have the responsibility to raise wholesome children and manage healthy families and Allah has built the skill in each woman – we just need to unlock it. If we polish the right practices in light of Quran and Sunnah we can paint the perfect picture of a Muslim Ummah – like an artist. So why exactly are the women folk lagging behind in doing a good job as ideal Muslimahs? We have wrapped ourselves into a complicated shell, really. There is this hullabaloo about feminism and this new term has been coined – the Femi-Nazi. What are we talking about? There is this constant race to overpower the male-dominated society when the natural balance that Allah has created implies that while men are the strong and the supporting gender, women are the creative and the managing. Somehow this beautiful balance has been translated to be ‘oppression’. Undoubtedly, women can be astronauts, army soldiers, marine biologists – they can conquer the skies, the ground and the leagues of the sea. BUT!!! Who is going to attend to the education and training of her children, the happiness of her husband, the care of her parents, and the service to the society? – THOSE are the real fields where she is a born expert by God’s will. Great women build great individuals and families which in turn build great societies and nations. THAT is the power vested in a woman by Allah. Yes! That’s what they call GIRL POWER!!! Look at the increase in the numbers of youngsters getting hooked to drugs, fornication, and crime. Why do you think that is happening? The mothers aren’t doing a very good job there, probably because they’ve disturbed the balance of being a homemaker first and anything else, afterwards. There is a world of possibilities and opportunities open for us to bring about a global change and we are confused by an identity crisis! It is not that we don’t have examples to follow. The Quran mentions the Virgin Mary or Mariam (salam be upon her) as we know her, as one of the most exemplary women who excelled in piety and chastity. The books of sahih hadith mention another brilliant example of Fatima (salam be upon her), the daughter of Rasool Allah (saw) to be a model of purity – an ideal homemaker in her roles as a mother, daughter and a wife. She’s been bestowed the rank of the Chief of the Women of Paradise. What more could be a perfect example for us to follow? We’ve got to take care of ourselves first – eat right, sleep right, study right, think right and say the right things! Next up, we have got to take care of our families – our parents, our siblings, relatives, our husbands, our children. We as Muslimahs need to be creative and productive and righteous in our lives. Personal training and grooming, hygiene care, education and home-planning – we’ve got to learn it all! 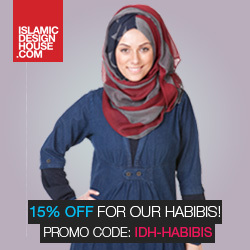 Habibi Halaqas has already taken a step towards making you an ideal woman! I am embracing my faults and I am polishing what I am built for. Would you join me? We're talking about self-esteem next! Stay tuned! Great job on this article, Mash'Allah! It acknowledges an appreciation for the natural balance of mutual support between men and women that can make a home and our society healthy and whole. It's a very important topic and I can't wait to hear more. Jazakallah khair! You hit this one on the spot. Bulls eye!! I am all for the "Muslimah" revolution... We need to step up and make others aware that we are not oppressed and domesticated in the sense the media portrays us... We are there to change the world... Like the saying goes.. Give me a good mother and i give you a great nation!! Here's to - Muslimah Power!! Thank you very much everyone for appreciating my effort. I'd continue to give you informative, inspiring and entertaining articles in the Self Esteem Series inshAllah. @Anum: I cant wait to post past 2 of this series in sha allah! Coming soon ! That's exactly true...........hope our muslim sisters start following the truth soon.Jazakallahkhair. Very true. It's very important for a Muslimah to be balanced and "on top of her game". A frustrated wife leads to a frustrated husband. A confused mother leads to confused children. So by working on herself first (rather than running around after "tasks" and "chores" and leaving her personal development behind), she can make managing her family much easier.